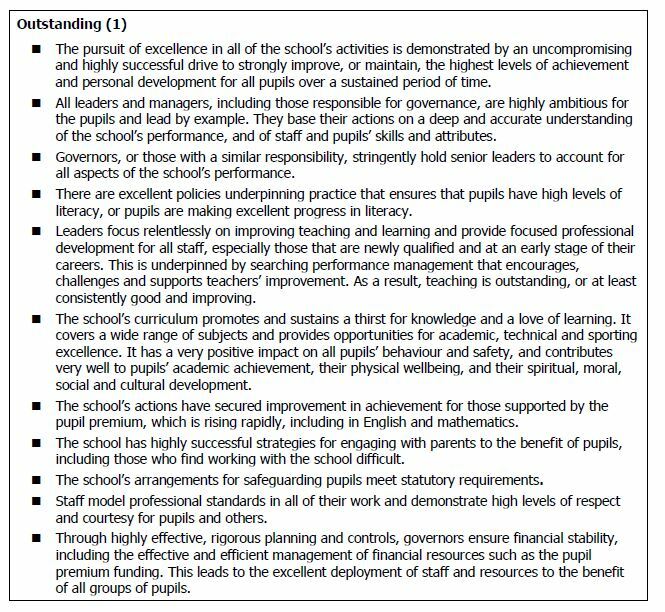 This section seems to be a “calling to account” and whilst there are new elements in it, it clearly builds upon: Achievement of Student, Quality of Teaching and Behaviour & Safety. 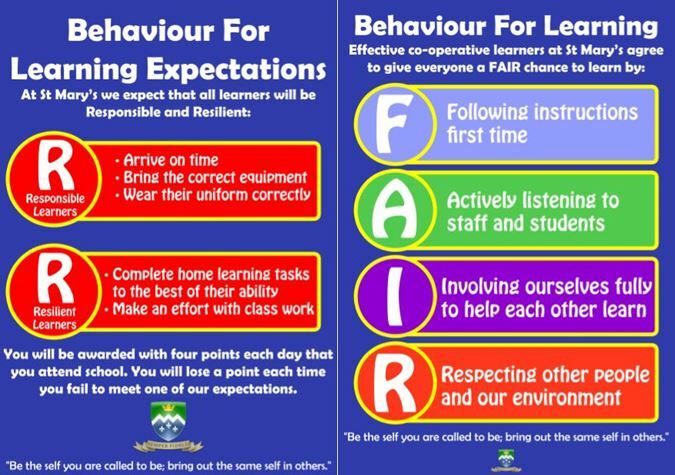 The Subsidiary Guidance and section in the School Inspection Handbook do little to raise a leader’s morale as there seems so many different elements to the judgement that you feel almost certain one will apply to the school. In short the inspection team are testing how robust the school’s self-review and evaluation processes are and whether having identified an issue the school has done something about it. Impact not effort is the focus. It is important to cross reference this section to the other ones within the SEF and provide the most up to date impact information, as much of the data the inspection team has, prior to visiting the school, is historical. Governance has, for the past decade or more, been seen as one of the key levers of school improvement. Sat underneath a whole array of structural changes within education in their various forms, around academies, free schools and Interim Executive Boards, is the fundamental belief that for schools to improve good governance is required. It is important to note that even if a school is deemed to “Require Improvement”, for Leadership & Management, the subsidiary guidance states that inspectors include an external review of governance as one of their recommendations. Firstly, “governors both challenge and support the school and hold …. to account for the achievement of pupils.” It is quite clear that the other sections within the Ofsted framework are increasingly subservient to pupils’ achievement. Secondly, governors are not expected to be routinely involved in the day-to-day activity of the school. Operational matters are for headteachers and senior staff to lead and manage. Thirdly, governors need to be well informed about key aspects of the school’s work. Write your “Report to Governors”, often presented at termly full Governing Body Meetings, in the style of a SEF with key information about the school under the headings: Achievement, Quality of Teaching, Behaviour & Safety and Leadership & Management. Ensure you have external moderation, possibly from a trained Ofsted Inspector, of your lesson judgements and involve governors in the process. Whilst our school adviser has moderated my lesson judgements for a number of years, then I’ve moderated the judgements of senior leaders, this year we took a slightly different approach. We invited in the school adviser to help moderate the senior leaders’ judgements as a team activity and also invited in a number of governors to quality assure the process. The governors weren’t asked to judge the quality of the lessons, they were asked whether they were satisfied with our process. Invite governors to quality assure the school’s self-review and evaluation processes. For a number of years, our governors have received the self-review and evaluation reports from departments. This year we will invite them in to observe the key meetings in the process of generating these reports. Again the question of whether they are satisfied with our processes will be crucial in fulfilling their role. They will also have the opportunity to hear first-hand about “strengths & weaknesses”. 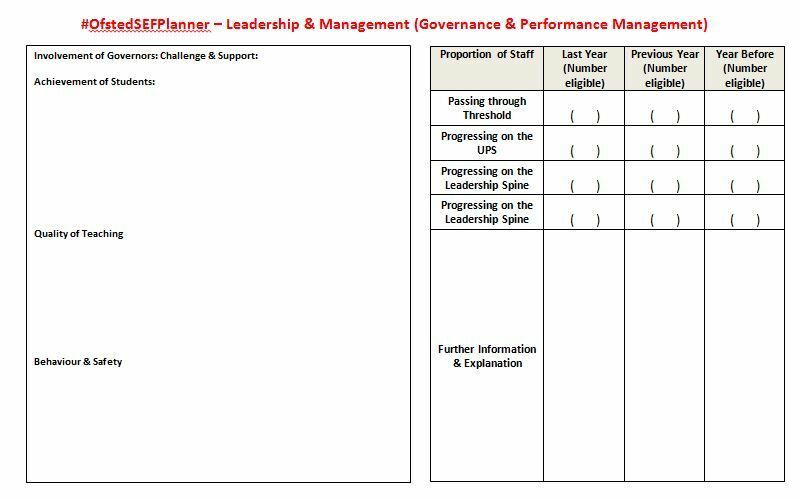 Inspectors will expect anonymised evidence of how performance management has been used to differentially reward staff. With the new Pay Policies currently being implemented in schools this is likely to become an area of greater scrutiny. I might as well say it, if results are not up to scratch the expectation will be that staff won’t receive pay increases. A few notes linking the proportion of staff who have not progressed along the various spines linked to achievement or quality of teaching and learning, as long as individuals are not identified, will help inspectors. This information should not be sent to inspectors but retained on site. 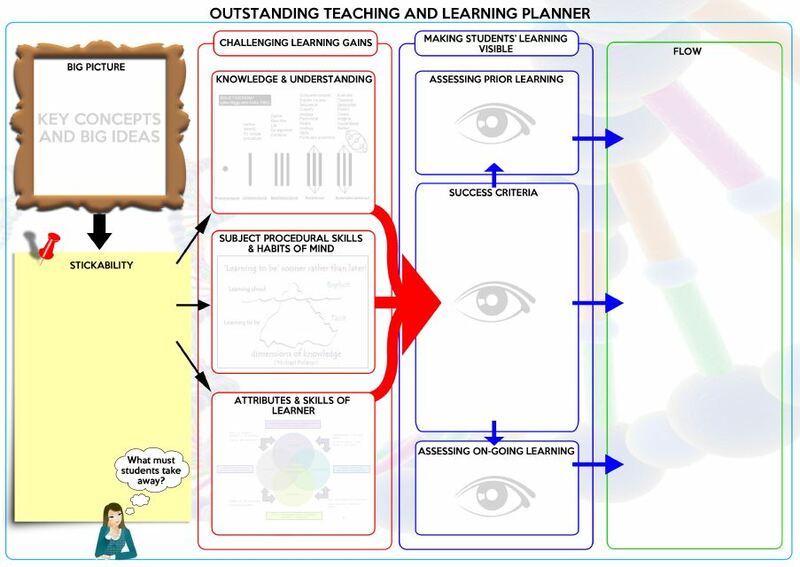 If you have completed the #OfstedSEFPlanner – Quality of Teaching you will have noticed there is a section that relates a school’s Quality of Teaching grades with Achievement. Anomalies need to be explained and actions linked to salary determinations and professional development for staff. Inspectors will look for evidence that the curriculum is meeting the needs of students. Part of this will be found in achievement and progress data but part will also be found in progression rates onto further education or into employment with training against local and possibly national data. Any curriculum partnerships and their impact on students’ achievements need noting. Where the curriculum does not match with key performance indicators, for example a school’s position on the E-Baccalaureate may be to insist students opt for it or not (Inspectors should note the E-Bacc is not compulsory, Subsidiary Guidance) should be agreed with the Governing Body. Evidence of Spiritual, Moral, Social & Cultural Development will also be factored into this judgement. 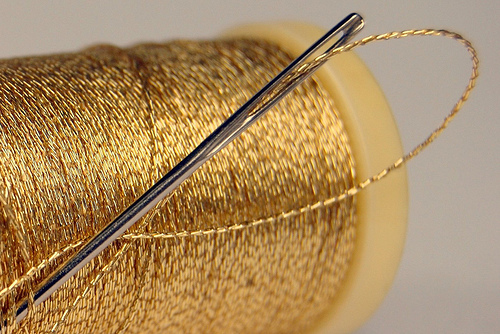 This is a thread that runs throughout the inspection. Evidence of this across the school should be collated for inspectors. 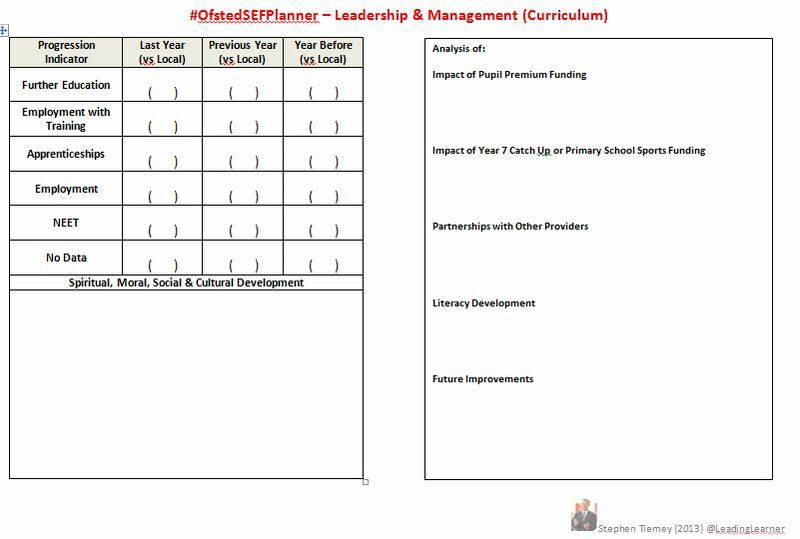 A lot of this information, particularly around progress of students entitled to Pupil Premium funding, will have been captured in the #OfstedSEFPlanner – Achievement of Students. Key additional information should be provided about the progress of students entitled to Pupil Premium funding still at the school and the progress of students who attracted Year 7 Catch-up Funding. Catch-up funding applies to students who did not achieve level 4 in either reading or mathematics at the end of Key Stage 2. These students attract additional funding and the impact of the curriculum, teaching and intervention programmes needs to be assessed via the progress they are making. 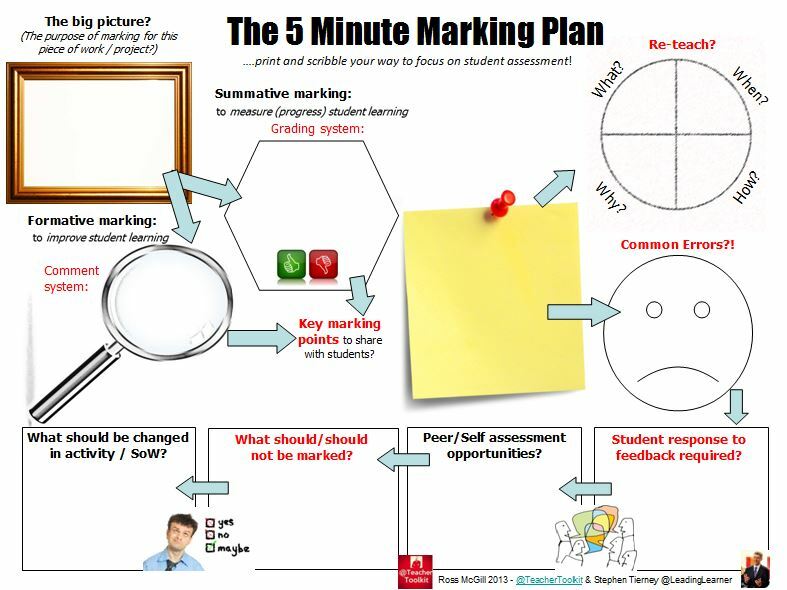 This can be linked to the overall development of literacy at the school and across the curriculum. The Primary School Sport Funding should be used to impact on pupil’s lifestyle and physical well-being through increased participation rates and access to various forms of sport and physical activity including competitive sports. Remember that a lot of this information must be available on the school’s website and inspectors will expect it to be there. The #5MinOfstedPlan has more details about the information schools are required to publish on websites. A lot of this section simply links back to the #OfstedSEFPlanner – Behaviour & Safety, in particular, the school’s work on addressing bullying particularly cyber-bullying. The views of students and parents through questionnaires and discussions with students during the inspection will help inform the judgement. Inspectors will also check the Single Central Record and this must be up to date and accurate. 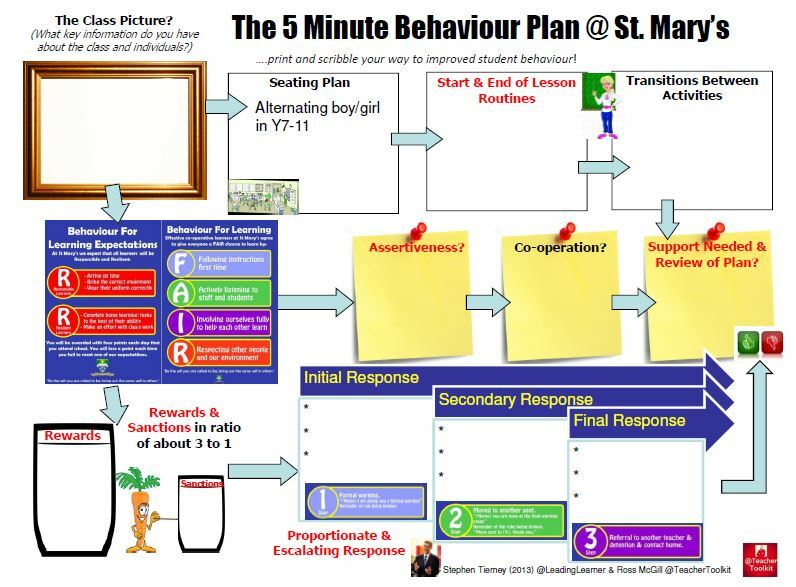 The #5MinOfstedPlan identifies key groups inspectors usually target and a process of checking if you want a bit more detail. 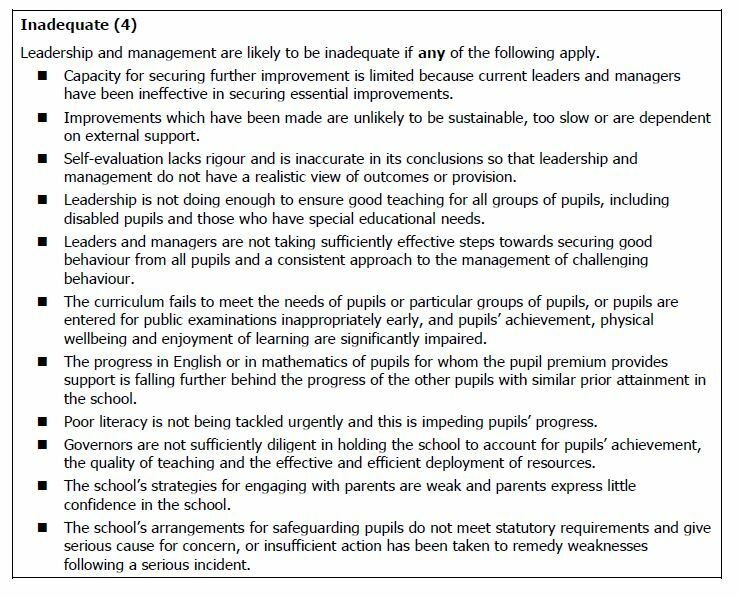 The tables below are taken from the School Inspection Handbook and will hopefully help you make your overall judgement for “Leadership & Management”. 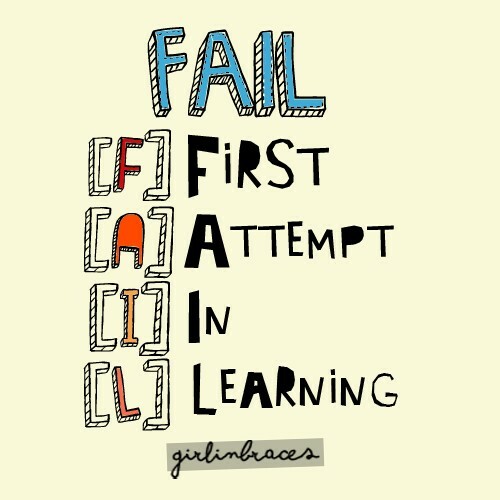 Why you have graded the school at a certain level? What would you need to do to secure this grading? Why is it not the grade above or below? It is worth noting “demonstrating the capacity to improve” in the Requires Improvement judgement and to note that this will differentiate between serious weakness and special measures in the Inadequate judgement.